The Peace Operations Training Institute is proud to present the latest student to be recognized in our 'Student Spotlight' section: Lieutenant Commander Muhammad Rashedul Karim. 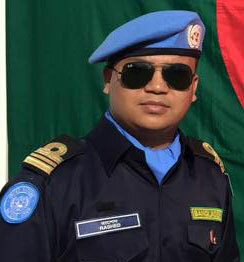 Lieutenant Commander Muhammad Rashedul Karim was born in the Noakhali District in Bangladesh in 1983 and joined the Bangladesh Navy as an officer cadet in January 2001. He was commissioned in the Executive Branch after two years of training at the Bangladesh Naval Academy. Karim completed basic courses at the BNS Issa Khan naval base, and later completed a specialization in Long Navigation and Direction through the Pakistan Naval Academy. He also completed an Electronics Warfare Course, Officer Warfare Course, and Principle Warfare Officer’s Course at the School of Maritime Tactics and Warfare. In 2012, he completed an International Maritime and Humanitarian Course through the United Kingdom Ministry of Defence. Karim has been appointed to various posts on naval ships, in Naval Headquarters, and at the Naval Academy in Chittagong, Bangladesh. He is currently serving with the United Nations Multidimensional Integrated Stabilization Mission in Mali. POTI does not verify the accuracy of Student Spotlight submissions. Submissions are edited for grammar and clarity. Are you interested in nominating yourself or another student for the Student Spotlight? Let us know. Congratulations Lieutenant Commander Muhamad Rashedul Karim. Amazing! Francis Owusu Takyi wrote on 06-07-15 at 2:51 p.m.
Assalamu Waleikum Lieutenant Commander Rashedul Karim! Congratulations! We spotlight students are happy that you are with us in POTI. Continue with this dedication and example for the children in your country! Waleikum Assalam ! Mohammed Haziz wrote on 06-11-15 at 9:55 a.m.
Congratulations Lieutenant Commander Muhamad Rashedul Karim! PEDRO EDGAR CARMONA VALERIO wrote on 10-18-15 at 7:57 p.m.
Assalamu Alaykum and kudos to you dear Lt Cdr. With a well grounded training and exposure, the sky will not only be your limit but a starting point. I wish you all the best. Abubakar Sadiq Aliyu wrote on 01-02-16 at 9:24 p.m.
Francis Owusu Takyi wrote on 06-17-16 at 9:34 p.m. I am so glad to belong to the POTI's community.Yet,commander Rashedul congtatulation,and your contingent has made good friendship in my country D R Congo. BANBAT is working for peace through MONUSCO. Djupatho James wrote on 08-27-16 at 12:19 p.m.
Tauqeer Asmat wrote on 09-28-16 at 8:42 a.m.
ADOMON FRANCK EUDES wrote on 02-07-17 at 6:25 a.m.
OWUDA GODWIN NURUDEEN wrote on 05-16-17 at 6:37 a.m.
Mwinyikombo Ally Mwinyikombo wrote on 07-10-17 at 9:15 a.m.
IWAENI PAUL OLUWASEYI wrote on 08-05-17 at 4:28 a.m.
Congratulations Lieutenant Commander Muhammad Rashedul Karim !!! I wish you much success, health, peace and long life to continue this struggle for peace. CARLOS RODRIGO DOS SANTOS FARIAS wrote on 01-31-18 at 8:55 p.m.
Félicitations Lieutenant Commandant Muhamad Rashedul Karim !!! Puisses DIEU partager votre grâce avec nous, Bravo une fois de plus et bien de choses a vous. MINGHEU MARLYSE MICHOU wrote on 04-24-18 at 9:47 a.m. I wish you every success in your career to contribute to sustainable peacekeeping missions. Mohamed Elmurtada Elshiekh Abdalla wrote on 12-04-18 at 11:30 p.m. Excellent, Lieutenant Commander Muhammad Rashedul Karim. Peace is a vital condition for humanity and our families. LEANDRO CATALINI wrote on 03-27-19 at 11:29 p.m.
To leave a comment, you must be logged in and have a verified email address. Log in here. The Peace Operations Training Institute provides globally accessible and affordable self-paced, online, on-demand courses on peace support, humanitarian relief, and security operations. We are committed to bringing essential, practical knowledge to military personnel, police, and civilians working towards peace worldwide. The Peace Operations Training Institute is an independent, not-for-profit, non-governmental organization (NGO) governed by an international Board of Directors.